Sambarballi Tambuli is a very simple and healthy drink/gravy. Tambuli is basically a coconut-buttermilk based gravy. 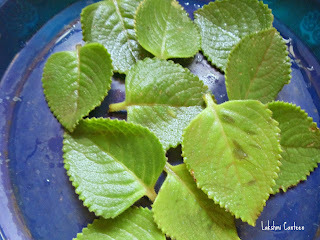 Sambarballi leaves are very healthy and the juice extracted from the leaves is used to cure cough and cold. The juice is especially given to small children for curing cough and cold. 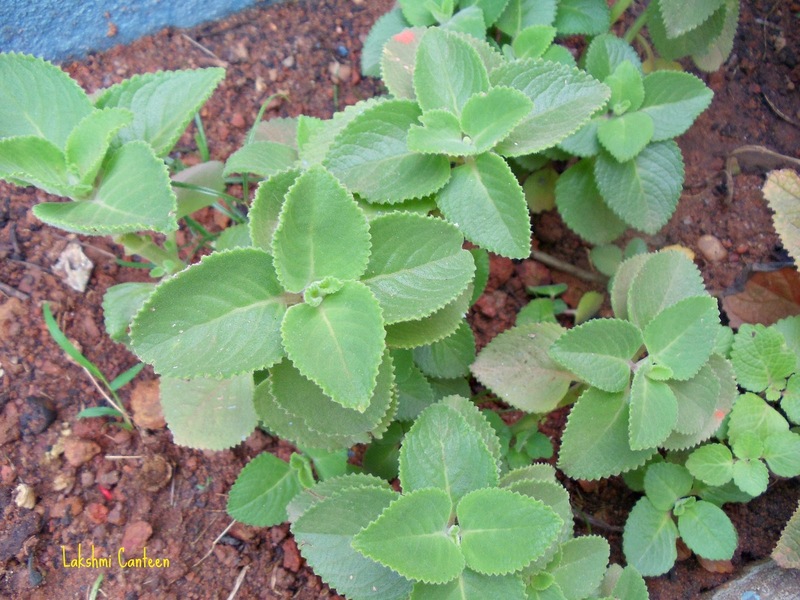 This plant doesn't require special care and hence many people grow it in a pot. The picture below is a picture of the plant in our home, back in India. This is my husband's grandma's recipe and my MIL made this for me. I loved it as a drink. In one of my earlier posts, I had posted a recipe for chutney using the same leaves. Try making this healthy Tambuli. I am sure you all will love it as a summer drink! Then grind the fried leaves, cumin along with grated coconut, green chilli, tamarind and salt with little water. Transfer it to a bowl. Add buttermilk and mix well. The consistency of Tambuli should be medium thick. For Seasoning- Heat oil. Add mustard seeds. Once it starts spluttering, add curry leaves and turn off the heat. Add this to prepared tambuli and mix well. Sambarballi Tambuli is ready!! Serve it with rice or have it as a drink on a hot afternoon. Above measurement serves four people. 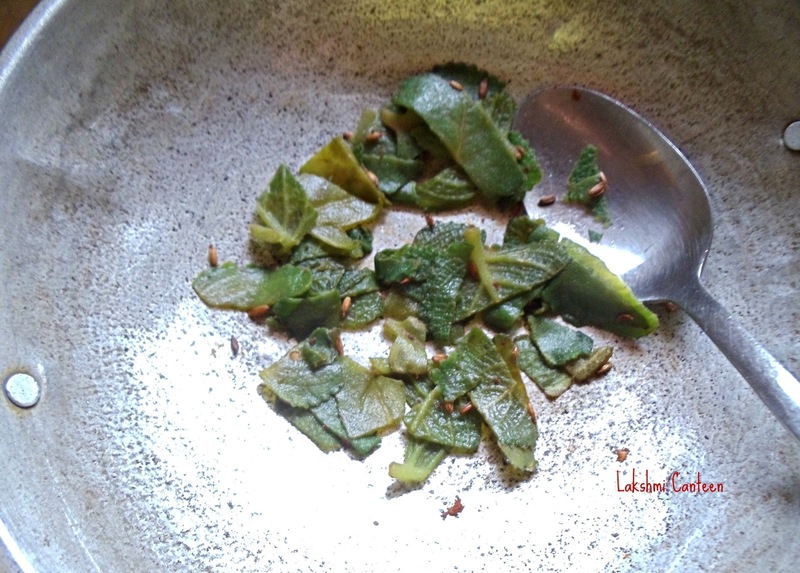 Kyane Salli Upkari is a very tasty side dish. In Konkani, Kyane Saali means banana peel. During my recent visit to India, I had been to my MIL's native. They have a very big farm. The farm has hundreds of Arecanut and Coconut trees. They also grow banana and many vegetables. While coming back we brought raw plantain (Nendrabale) and many other home grown veggies with us. We had many raw plantains and hence decided to make chips out of it. Instead of throwing the peel, my MIL made a tasty side dish. Never thought the peel can be used. So next time when you get plantains to make chips, don't forget to save its peel. *Nendrabale is a variety of banana which is cultivated abundantly in Kerala and is used to make chips and Halwa. Take the peel got from 4-5 raw plantains (the raw plantain has to be of nendrabale variety). 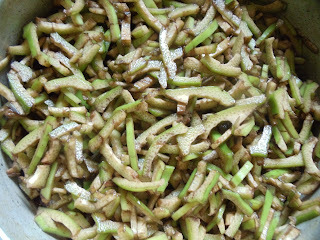 Wash it and then cut them into thin strips of 2-3cm length. Then heat oil. Add mustard seeds. Once it starts spluttering, add urad dal, broken red chilli. Fry until urad dal turns light brown and then add chopped raw banana peel. Mix well. Now add salt, jaggery and sufficient water. Close it with a lid and allow it to cook. Once it looks done (it becomes soft), add grated coconut and mix well. Continue heating for two more minutes and turn off the heat. Kyane Salli Upkari is ready!! Serve it hot, as a side dish to rice. Above measurement serves 3-4 people. Kelipanna gatti can be served for breakfast or for the evening snack. Try making it and enjoy! *Boiled rice (red rice) is a variety of rice). If red rice is not available then substitute it with white rice along with 1/4 cup of grated coconut. Wash and soak both the rice together, for 6-8 hours. Then grind it to get a thick, fine paste (add water as required). The resulting rice paste shouldn't be too thick/thin. It should be of spreadable consistency. Batter is ready. Then wash the banana leaves. Wipe off the extra water on the leaf (it should be absolutely dry). If using frozen leaves, keep it out of the freezer for 30-45 minutes and then clean it (handle the leaves with great care as there are higher chances of the leaves getting damaged. If the leaves are too crispy then run the leaves over the heat for few seconds, which will make it softer and easier to handle). Make small square or rectangular pieces of the banana leaf (You can cut it into small or big size). Keep in mind that it should fit well in your steamer). Now spread the pieces of banana leaves on a flat (spacious) surface. Put little amount of rice batter on one of the small banana leaf pieces. Now start spreading the batter to get a uniform, thin layer of the batter, as shown in the picture below. Note: You can as well try spreading grated coconut on the batter to enhance the taste (optional step). Once the spreading is done, start folding the leaf from one end. Continue until it reaches the other end, as shown below. Repeat the same process to rest of the banana leaf pieces. Pile up the rolled banana leaves in a steamer and steam it for 25-30 minutes. Once done, remove from the steamer. Leave it to cool for 3-4 minutes. Open the folded banana leaf. The cooked rice dumplings looks like this. Remove the rice dumpling carefully and transfer it to a plate. Kelipanna Gatti is ready!! Serve it hot with generous amount of coconut oil. Some people also serve some spicy dish along with it. Above measurement serves 3-4 people.